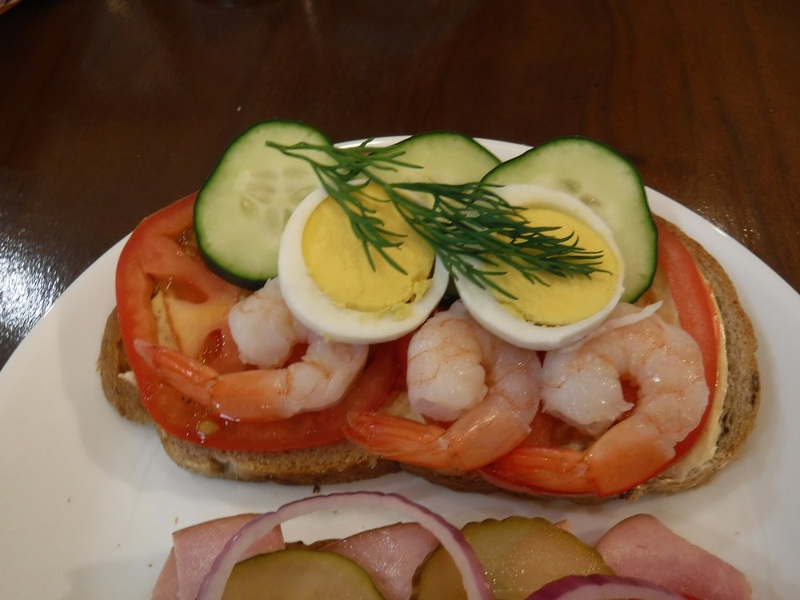 Smørrebrød are a long-standing Danish tradition. 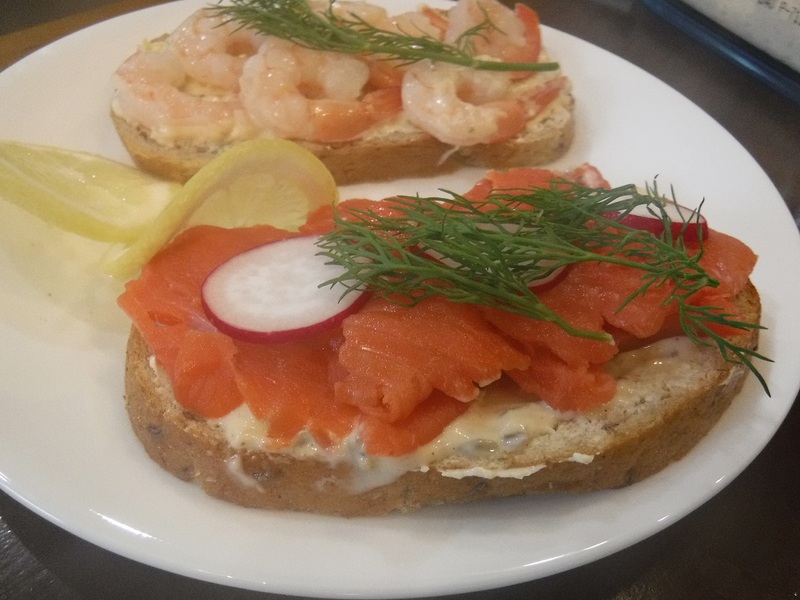 The name comes from the two essential ingredients and the starting point for smørrebrød: butter (smør) and bread (brød). Danish butter is rich and high in butter fat. 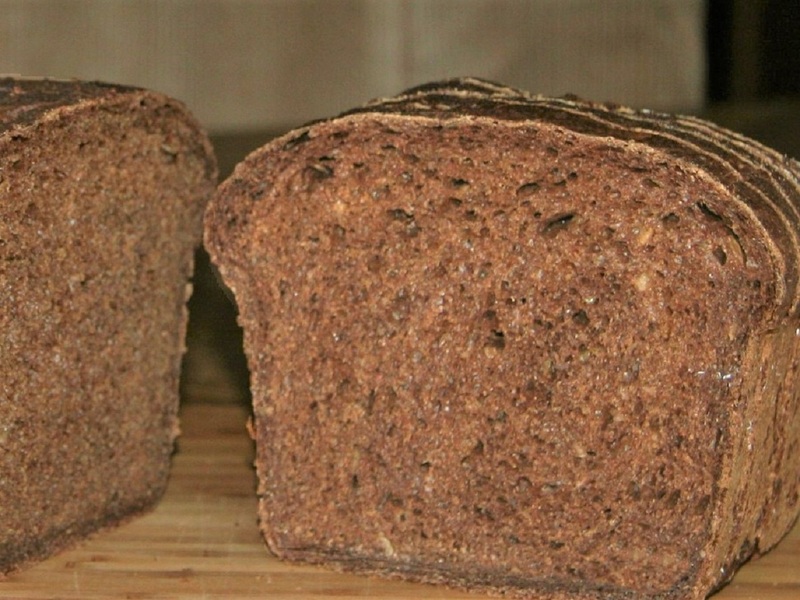 The bread is a dark sourdough rye bread called rugbrød. 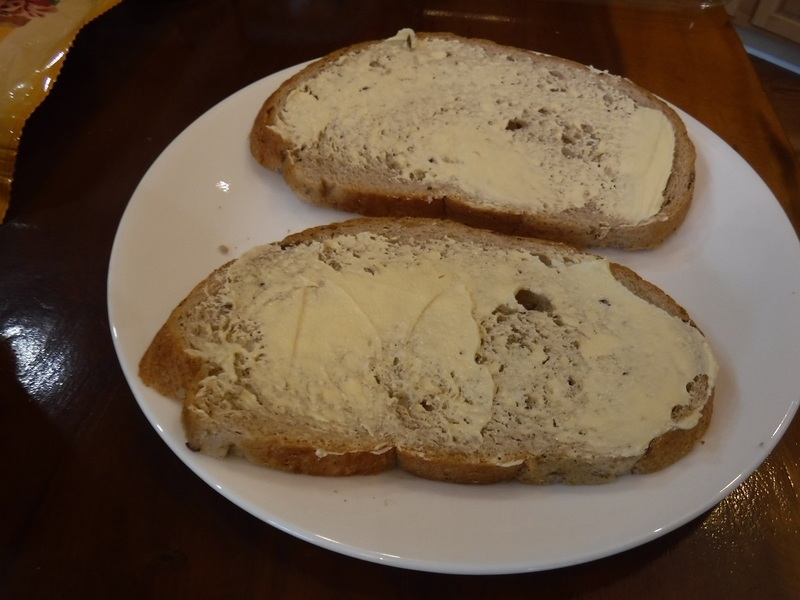 Once you have buttered your bread that is where imagination and artistry begin. 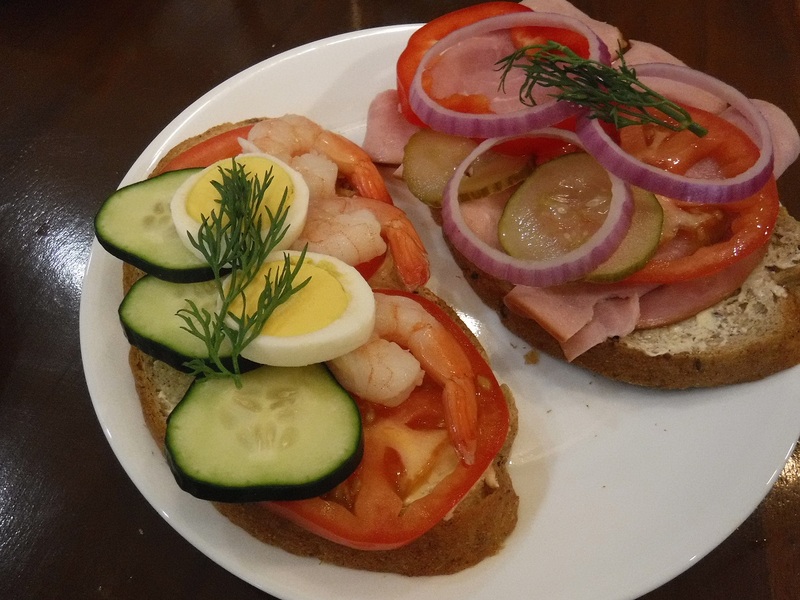 Smørrebrød are open faced sandwiches served on a plate and intended to be eaten with a knife and fork. They are not suitable to be picked up in the hand and eaten like regular sandwiches. 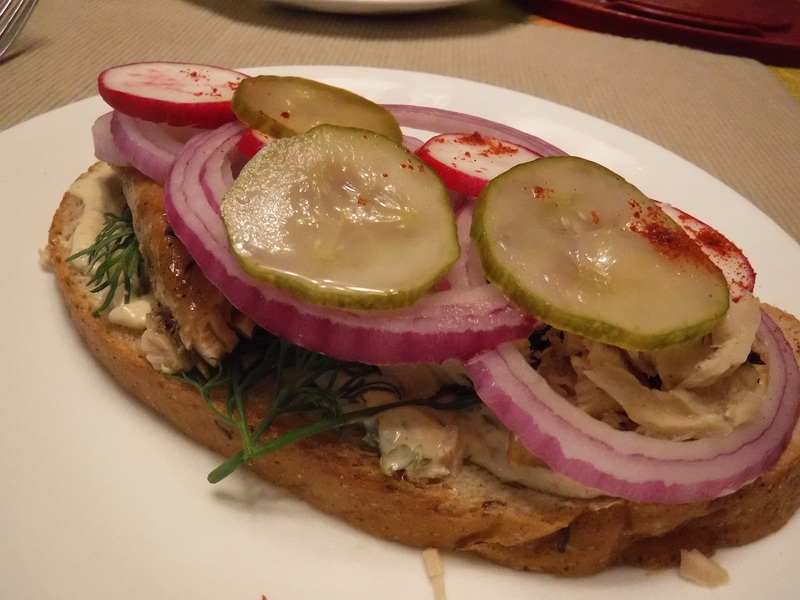 Most Danish restauraants offer smørrebrød on their menus but there are many restaurants that specialize in the famous Danish sandwiches. On a recent visit my sister, Pattie Sue, and I decided to explore a bit of the culinary tradition of our Danish heritage. We were curious about the traditions that seemed to have been lost in the wilderness pioneer experiences of our grand and greatgrandparents in 19th and early 20th century Michigan, Wisconsin and Minnesota. It is a beginning for us and we welcome you on our pilgramage of discovery and enlightenment. (Left) The smørrebrød sandwiich starts here with slices of dark, hearty sourdough rye bread slathered with rich Danish butter. From this point on it is all a matter of the foodstuffs on hand and your imagination and artistic inspiration. 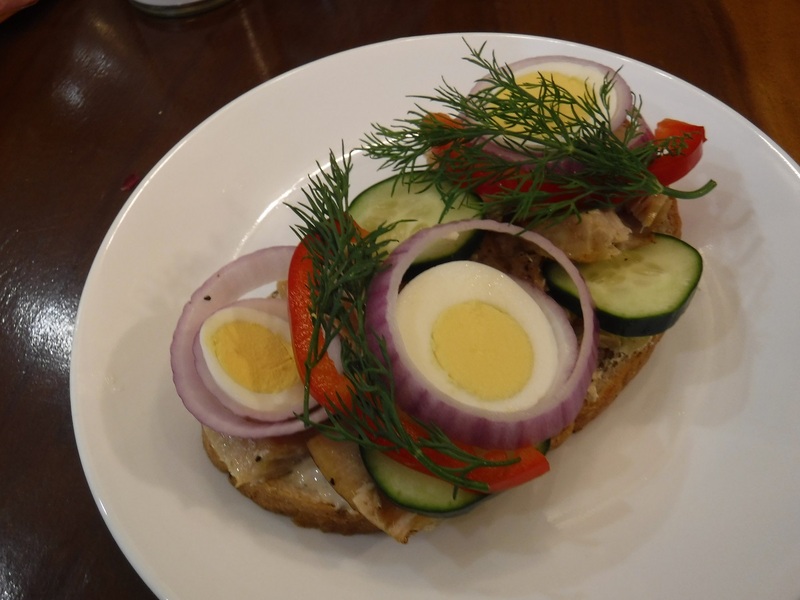 Before strating we did an Internet image search and used the photos of smørrebrød creations we found to guide us in our first attempt at these homeland treasures. (Right) Buttered rye bread, a layer of remoulade sauce topped with thin slices of salmon and garnished with sliced raddish and dill weed. 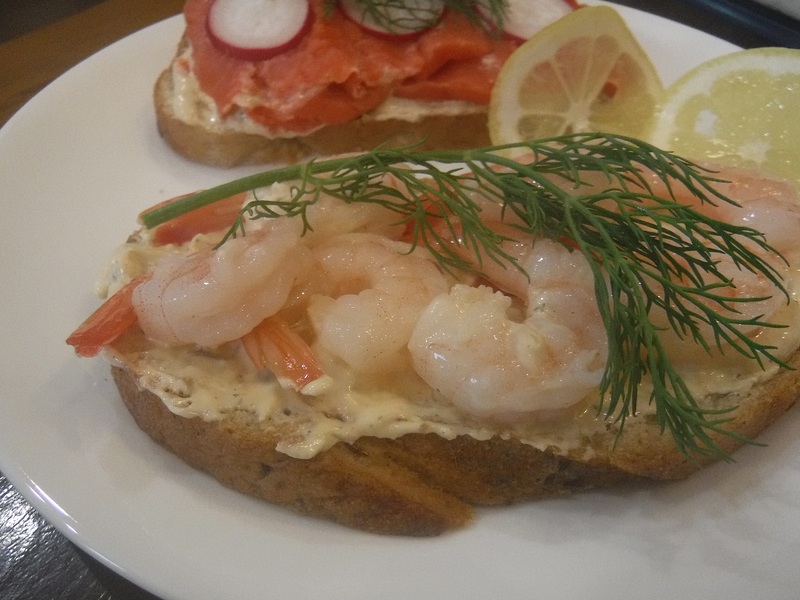 (Left) Buttered rye bread, remoulade sauce, 31/35 tail-on shrimp and grnished with a sprig of fresh dill weed. 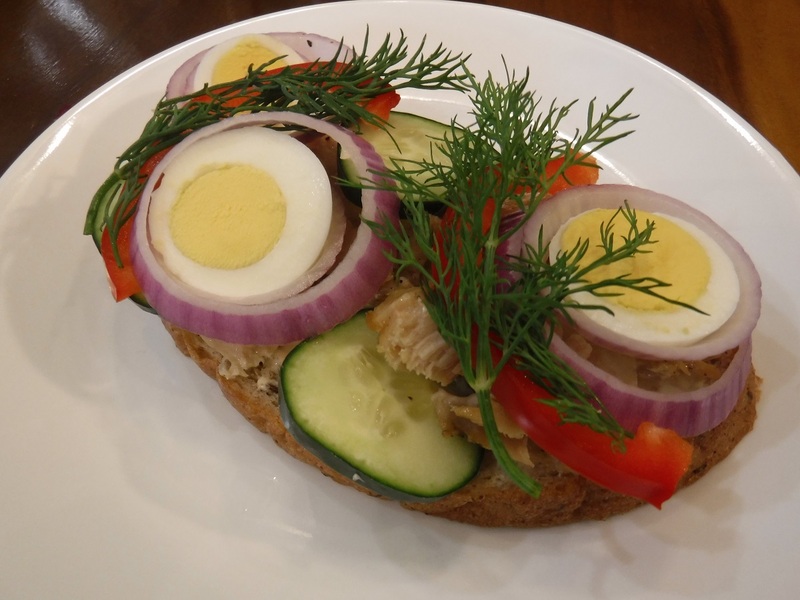 (Right) Buttered rye bread, remoulade sauce, poached white fish with slices of hardboiled egg, cucumber, red onion and red Bell pepper; garnished with sprigs of fresh dill weed. (Left and Right) Two more views of the previous sandwich, buttered rye bread, remoulade sauce, poached white fish with slices of hardboiled egg, cucumber, red onion and red Bell pepper; garnished with sprigs of fresh dill weed. 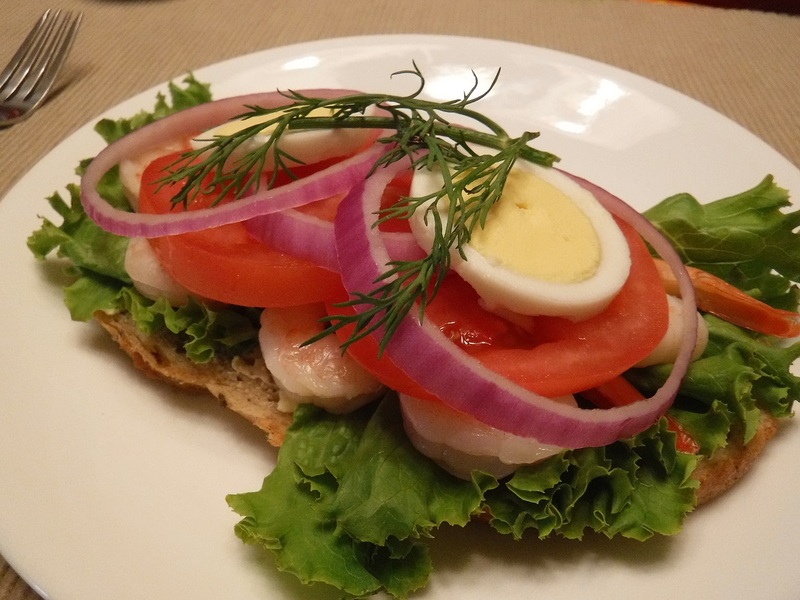 (left) Buttered rye bread, slices of vine ripe tomato, 31/35 tail-on shrimp, slices of cucumbe and hardboiled egg garnished with a sprig of dill weed. 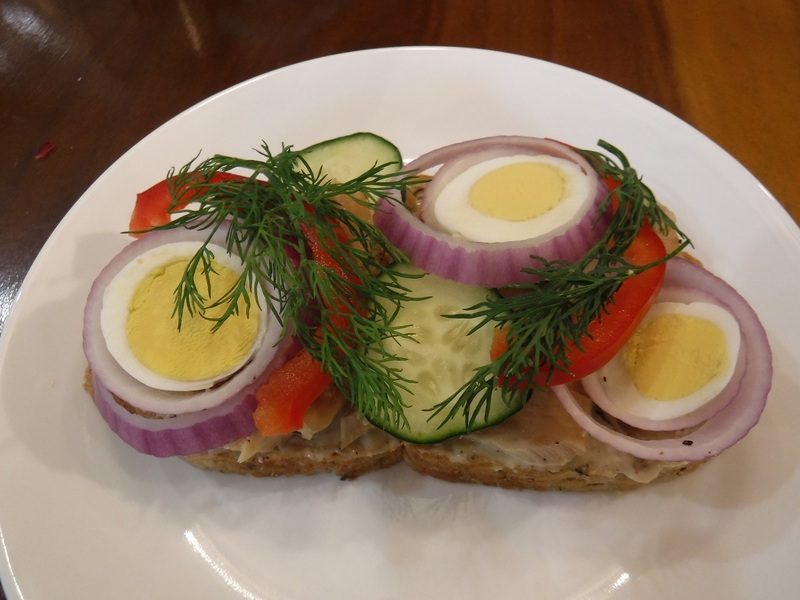 Buttered rye bread, remoulade sauce, deli-sliced roast ham, slices of ripe toamtoes, agurkesalat (Danish pickles), rings of red onion and dill garnish. 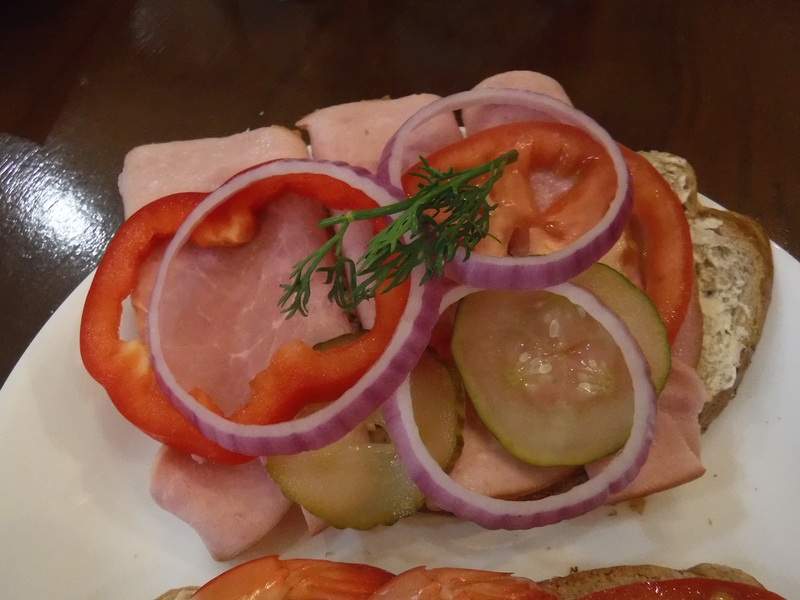 (Right)Close-up view of the previous buttered rye bread, remoulade sauce, deli-sliced roast ham, slices of ripe toamtoes, agurkesalat (Danish pickles), rings of red onion and dill garnish. 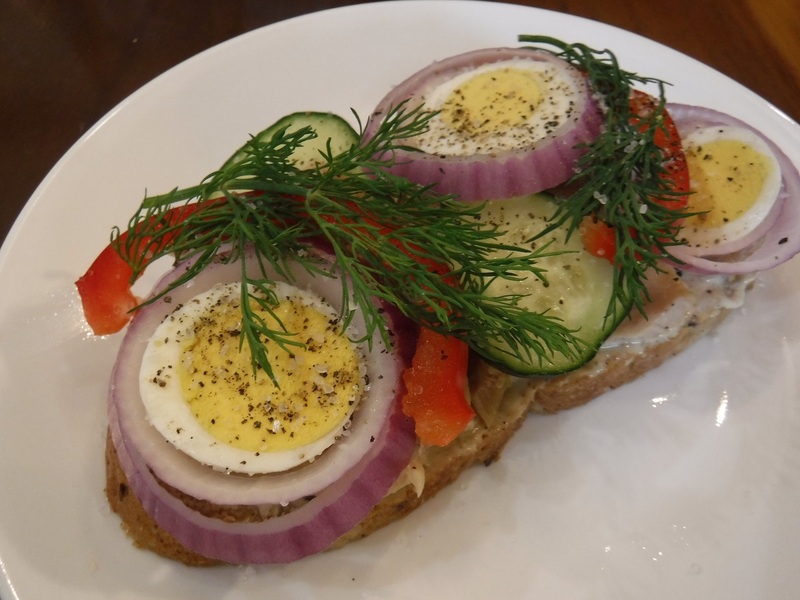 (Left) Buttered rye bread, remoulade sauce, poached white fish, rings of red onion, slices of hardboiled egg, sliced red Bell pepper, garnished with fresh dill weef and seasoned liberallty with fresh ground black pepper. (Right) Buttered rye bread, remoulade sauce, lettuce 31/35 tail-on shrimp, slices of toamto, red onion rings, sliced hardboiled egg and dill garnish. 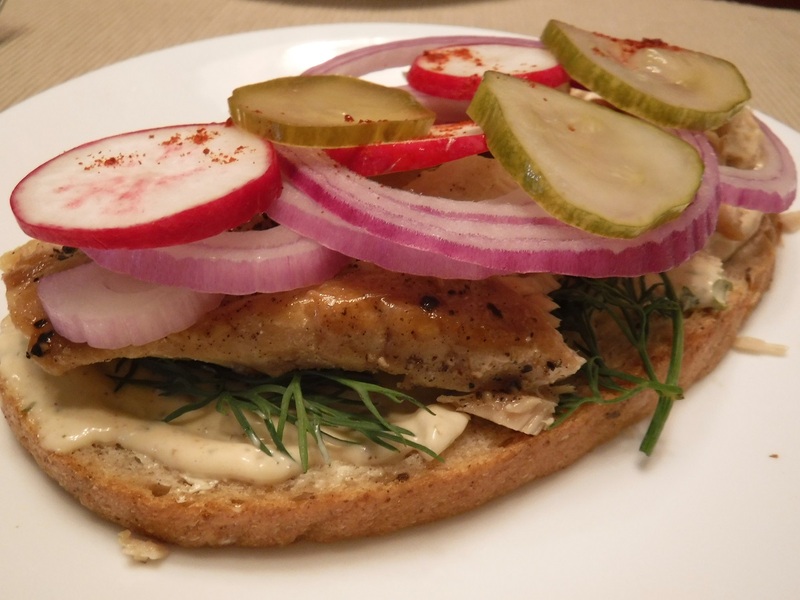 (Left and Right) Two views: Buttered rye bread, remoulade sauce, poached white fish, sprigs of fresh dill, lots of red onion rings, sliced raddish and agurkesalat (Danish pickles). (Center) The smørrebrød pairs werll with many other side dishes. 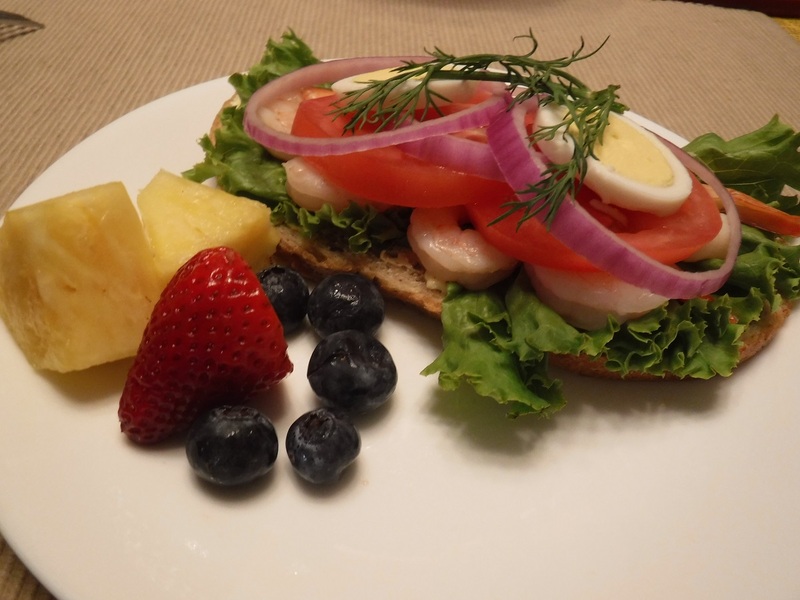 This shrimp based smørrebrød was very tasy and paired well with some fresh fruit, here blueberries, strawberry and chunks of fresh pineapple.